The Environment Minister, Alex Attwood, has told local residents he has yet to make a final decision on the shape of his forthcoming inquiry into modifying the noise regulations governing George Best Belfast City Airport. Belfast City Airport Watch representatives, Dr Liz Fawcett, Joe Watson and Joe McGlade outside Parliament Buildings in Belfast where they met Environment Minister, Alex Attwood to discuss the issue of aircraft noise. 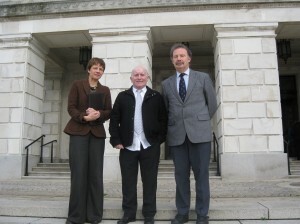 The Minister met a delegation from the umbrella residents’ campaign group, Belfast City Airport Watch (BCAW), at Parliament Buildings on Monday, 21st November. Two months ago, the Minister announced that he was going to hold an inquiry which would investigate how the planning agreement between the Department of the Environment and the airport could be altered. The planning agreement is intended to provide protection for residents against undue levels of noise pollution from planes. However, the airport’s own figures show that the number of people affected by noise at a level regarded as serious by the UK government has risen dramatically in the last few years – from 3,522 in 2007 to 11,422 in 2010. At today’s meeting, the Minister told residents that he was awaiting legal advice prior to making a final decision on the form the inquiry into modifying the agreement would take. The residents’ delegation asked the Minister for assurances that he would, in the meantime, enforce two crucial clauses in the planning agreement – relating to late flights and the number of seats offered for sale by the airport. Mr Attwood stopped short of promising to enforce either clause if it was breached. However, he did tell the delegation “My actions speak louder than words” when pressed on whether he would enforce the seats for sale clause if it was broken. Figures obtained by BCAW from the Department of the Environment show the number of seats offered for sale in the 12 months to the end of August 2011 was 1,996,675 – very close to the limit of 2 million stipulated by the planning agreement. The Minister also told the delegation he had asked his officials to obtain regular information from the airport on the reasons for any flights after 9.30pm. Under the planning agreement, flights are only supposed to take place after 9.30pm “in exceptional circumstances”. Yet, last year, there were 503 late flights, according to the airport’s figures. “We’re very pleased that the Minister is willing to engage with residents and with the issue of aircraft noise,” said Dr Liz Fawcett, Chair of the BCAW Steering Group. “We hope that the Minister will be prepared to enforce the planning agreement while his inquiry takes place. The scale of the noise problem for residents has dramatically worsened within the last few years, and the airport’s own figures show that many more people close to Belfast City Airport are affected by a significant level of noise than is the case at major airports such as Stansted or Gatwick. Consultants’ reports commissioned by the airport show that, in 2010, 11,422 people were suffering from a level of aircraft noise deemed by the UK government to cause “significant community annoyance” – compared to just 3,522 in 2007. (57 LAeq or over, averaged over 16 hours). A mere 1,500 people suffer from noise at the same level close to Stansted airport, and just 3,600 experience this level of noise near Gatwick, according to figures from the Department for Transport. The same consultants’ reports show that, in 2010, 23,810 people living near the City Airport suffered aircraft noise at a higher level than that recommended by the World Health Organisation – compared to 12,084 in 2007. (This is the number who experience noise at 54 LAeq or over, averaged over 16 hours – in fact, WHO recommends a level no more than 50 LAeq but that level is not measured by the consultants’ reports). Further information released by the airport show that there was a 40% increase in the number of late flights at the airport last year, compared to the previous year. The airport’s statistics show that there was a total of 503 late flights after 9.30pm last year – an average of 1.4 late flights per day – despite the fact that the airport’s planning agreement stipulates that late flights should only occur “in exceptional circumstances”. This compares to 359 late flights in 2009. Lets hope the Minister sees sense so we can move towards getting the runway extended ASAP !! a FEW business travellers vs TENS OF THOUSANDS of local residents ??? I think you may be both underestimating and exagerating in the same sentance to make a point. Poor form and gives very little weight to your cause. Yep have read them ??? Its an Airport !! Aircraft make noise …… Fact. To right its an airport get ova it. It would boost northern ireland eco. I live right under flight path and most of the times dont hear a thing. People just love to complain about somthin! You lot who like to complain need to do one of two things. Aircraft noise is not a problem for everyone, but it’s a problem for a great many people. Some time since the last comment but I’m increasingly suffering from noise from planes taking off and landing. Conversation is impossible during these times, and I’ve been woken up by flights landing before 6.30am very often. In the original agreement allowing the airport to operate commercially, it was not supposed to have any planes take off or land over the city, and was not allowed for use by jet planes except for the ‘whispering jet’. This was to protect residents from noise and nuisance. But it seems that our wonderful politicians have since decided that its ok for residents to be disturbed, and their health and property values depreciated, in order to help the economy of the province? How was that allowed to happen? And just who is profiting from it? Thank you for your comment Irish Lass. WE at BCAW are unaware of flights operating before 6.30 am and we would be very keen to hear of anyone else who has noticed this. We knew that the airport had been restricted, when it first opened, to using turbo props and the “whisper” jet only. We were not aware however, that there was a stipulation in the original planning agreement which banned aircraft taking off and landing over the city. We are of course open to correction on this and would welcome anyone with further information on this topic. Again our thanks to you for taking the time and trouble to contact us and we would encourage anyone with concerns to contact our website.